In days of old, crossing from Glen Isla to Braemar was no easy task. 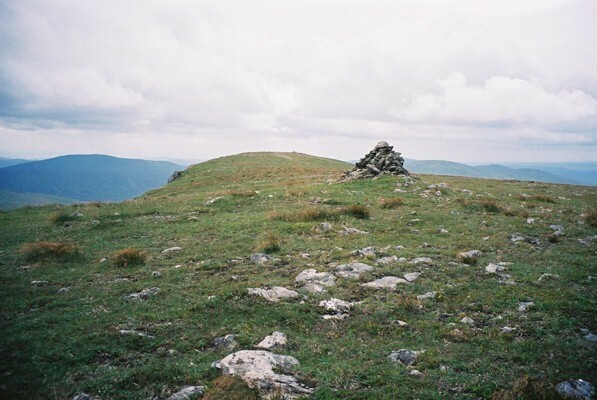 The drovers and travelling merchants faced an impenetrable lump in the shape of Glas Maol and its neighbouring peaks, Creag Leacach and Cairn of Claise. With no handy low level glens to create a road through, they had to go up and over. The head of Caenlochan was steep and craggy so in the end they resorted to a route that took them up and out of Glen Isla, over the long southern ridge of Monega Hill, and on to Glas Maol. In good weather it must have been hard work driving cattle or hauling goods over this road. In hostile conditions, it would have been downright dangerous. The old road is now a public right of way and forms the outward leg of this assault on Monega Hill (908 metres). Leave the parking area at Auchavan and head north along the track towards a substantial bridge spanning the River Isla, on your right. Don't cross but go straight on towards woodland on the left. Before you reach this, bear left on a short grassy path that climbs up the edge of the plantation to a track above. Turn right and follow the track north. The way runs alongside the River Isla to reach Tulchan Lodge, a little under three kilometres on. The route crosses the burn coming down Glen Brighty, up to your left, by a solid wooden bridge, then bears right past the lodge entrance gate. There's a sign here pointing the way to Monega Hill. Continue along the track as it skirts below the wooded policies of Tulchan Lodge and then a larger forestry plantation. At the northern end of the densely packed conifers, a green Scottish Rights of Way and Access Society sign points left for Monega Hill. However, to avoid tramping through reedy and muddy ground, it's worth continuing on the track for around 500 metres. After crossing the Glas Burn, turn left on a grassy path that follows the water upstream. The ascent is hard work but height is gained quickly. The path curves right to reach a gate part way up the hill. Above this, another steep section must be endured but higher up things ease off a bit and the final approach to the summit is a very pleasant stroll over low heather with superb panoramic views. The summit of Monega Hill is actually off the ancient right of way, the drovers clearly having little interest in bagging the peak. The cairn sits just a few metres back from craggy slopes plunging into Caenlochan Glen. It's worth venturing towards the edge (carefully, of course!) 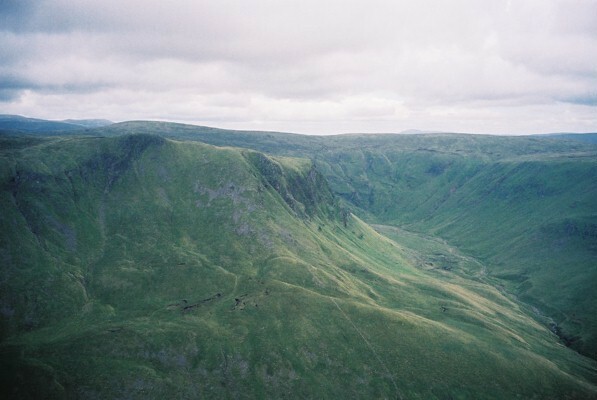 just to peer into this dramatic and remote valley, popular with botanists due to the profusion of rare flora. Head west from the summit to rejoin the right of way in the col to the north-west of the top and follow the track on to Little Glas Maol. The way skirts to the north of the summit to reach a junction of tracks by a stone ruin. Go left here, almost turning back on yourself, walk over the top of Little Glas Maol and follow the track down the southern flank of the peak on to Shanovan Hill. The route drops into Glen Brighty and follows the burn down to a high gate and fence at the back of Tulchan Lodge. The track continues through the gate, but this is marked 'private'. Instead leave the track, go left and follow the fence north and then east, returning you to the track below the lodge. Underfoot the going is marshy in places. Back on the track, turn right and follow it back down Glen Isla to Auchavan. Distance 11 miles/18km (circuit), 9 miles/14.3km (up and back). Start Auchavan, at end of Glen Isla public road, grid ref NO 193696. Parking Riverside spaces on track just beyond Auchavan and before the bridge over the River Isla below Dalhally. Grading Hill walk with strenuous ascent suitable for fit adults and older children. Track and path throughout. Dogs on lead due to sheep grazing. A great circuit can be made by returning over Little Glas Maol, Shanovan Hill and Glen Brighty. However, the environs of Tulchan Lodge are private and this means a 500 metre stretch of detour round the fenced lodge grounds. This requires skirting between a fence and forestry over quite boggy ground. Minor inconvenience for an excellent walk.